The month of November is the time to get Bear Naked with Skimble. 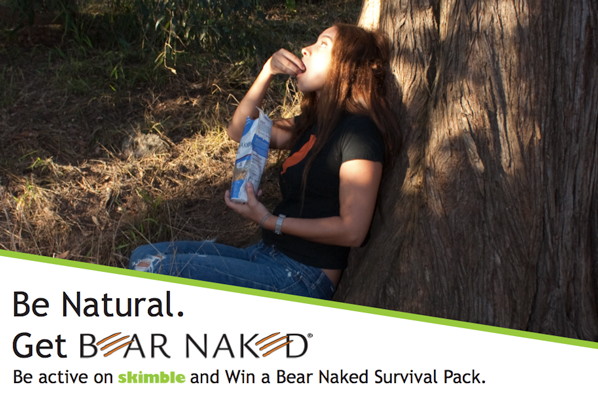 Be active and be one of the lucky winners to get a Survival Pack filled with your favorite Bear Naked granola products. So get out there. Run, dance and play tennis because at the end of the month, active Skimblers will be the proud owners of an amazing survival pack packed with natural goodness. Be Natural with Bear Naked – 100% Pure & Natural Granola! This entry was tagged bearnaked, contest, contests, granola, natural, skimble, win. Bookmark the permalink. Home (gym) for the Holidays? Win a TRX Suspension Training Pro Pack & stay trim anywhere with Skimble.